Use VbCrLf to create a carriage return in your message to be displayed. Somewhere within your macro you will need a command like this: MessageSoFar = MessageSoFar & vbCrLf & ActiveCell.Value . 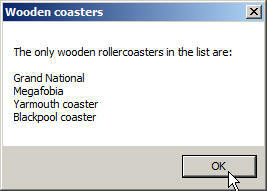 Save this file as Show wooden coasters and close it down.